Naturals No.015 lash is ideal for achieving a subtle yet gorgeous multi-toned lash with a light and delicate finish. 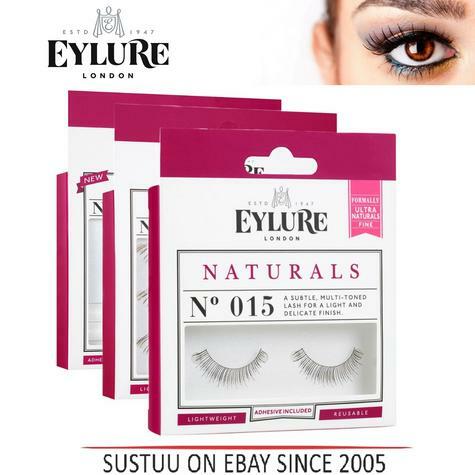 Eylure strip lashes enhance the natural beauty of your eyes and can be applied with ease. With a natural feel, the lashes contour the eye perfectly and are long lasting. A loosely woven, compact lash with a soft, even finish. Eylure strip lashes enhance the natural beauty of your eyes. Suitable for all eye shapes. The Naturals 033 is a natural, angle lash with a lengthening finish. They are suitable for regular or special occasions and are long lasting. Eylure strip lashes enhance the natural beauty of your eyes. They are suitable for all eye shapes and can be used for any occasion. The pack contains set of lashes, applicator glue and an instruction booklet. With a natural feel, the lashes contour the eye perfectly and are long lasting and reusable. The Starter Kit No.020 (Naturals) is for the beginner that is looking for a gossamer fine, evenly balanced lash for light length and fullness. Whether it’s for subtle night or day-time chic, the lashes are both simple and elegant. The Eylure strip lashes enhance the natural beauty of your eyes. Not only are they suitable for all eye shapes, but they are reusable and long lasting. The kit includes a set of lashes, a practice lash, an applicator and 2 applicator glues to ensure ease in applying lashes. A gossamer fine, evenly balanced lash for light length and fullness.